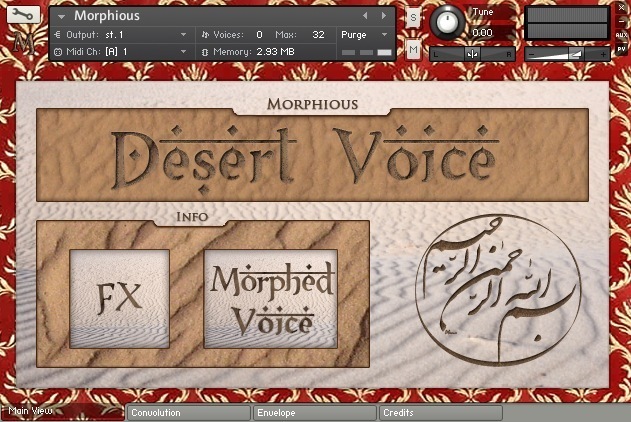 Desert Voice, Virtual Vocalist from Sonokinetic. stompboxjon's review"You will get your money's worth"
Sonokinetic Desert Voice is a collection of samples/patches of 6GB worth of sounds. All of the patches are in different categories so you can easily navigate through them to find what you are looking for. Breath, Morphious, Songs, Vocal Loops are some of the names of the categories that you will see. It doesn’t matter which patch you are working it you can change the key of it to whatever the key of your song is in. All of the patches are in the key of A by default you will need to change them on your own manually. The Sonokinetic Desert Voice seems to be more for an advanced musician who really understand working in “key”. If you understand working in key then the Desert Voice will really work for you. You will need a host application to play the patches in if you use it as a VST. You can use Kontakt 4 or above I think. 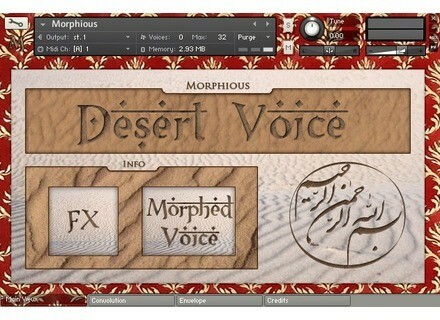 I have not been using Desert Voice long, but it seems to be very stable on my Dual Core i7 processor running 3.90 Ghz. It is very stable in Kontakt (as a host). I am not 100 percent sure about running Desert Voice as a standalone yet, because I have not tried. It only cost about 70 Euro’s and can be downloaded instantly. Installing can take some time depending on your computer speeds, most of the patches are pretty large files. When using Sonokinetic Desert Voice you will really get a bang for you buck because you will get a large library of sounds, and as I stated if you know about theory then you will really be able to layer these patches up in “key” of course and do some really good stuff. The quality of all of the sounds are pretty good, a few of the voices seem to get a little muddy for me and there are some I will never use. But overall, you will get way more than your money’s worth with Sonokinetic Desert Voice. songboy's review"A nice collection of Male Arabic Vocals"
I run this in Kontakt 5 on a Macbook Pro i7 with an Rme FireFace 800. I use both Logic 9 and Ableton 8. I have noticed that this set works better in Ableton for me for some reason. Occasionally I get some glitches in Logic 9, some due to me not being patient and playing the instrument while it is still loading in Kontakts memory server. But other instances occur where one particular sample will have a distorted, digital clipping sound (not a good sound). I am not sure if it's my settings or Logic 9 itself, but I have not noticed the same behavior in Ableton. No real need for a manual on this one, it's simply a collection of samples pre-mapped to specific notes with some basic envelope options, a few harmony options and tempo. The configuration is very simple, just like any other basic Kontakt instrument. The setup is simple yet unpolished. Some of the controls are sort of hard to read as the interface appears a little fuzzy, like it suffers from low pixelation. The controls are very easy to access but I some panels seem like they waste a lot of space. The envelope tab for example only has 4 basic, sideways faders which occupy maybe 5% of the GUI. Besides the issues of "clipping" I have on a (very) few samples, everything else appear to run fine. So far I haven't lost any sets saved in my DAW's or Kontakt and now crashes of any kind. As for performance, if you are looking for a nice size collection of Male Middle Eastern voices with a fair amount of variability, then this will come in handy. I do feel like the instruments them selves need to be tweaked quite a bit to make it more "playable." For example, you can run a few notes that are next to each other and get some interesting phrasing, but then all of a sudden the next note in the succession has a super short attack and quickly blasts volume at you with almost no natural feeling. Although in fairness, I don't imagine many people trying to play this as an actual Instrument but more as a quick sampler. I have had this for over a year now but in all honesty, I don't use it that much. Maybe 3 or 4 tracks in the past year. What I like about this set is pretty much what it is, a collection of Male middle eastern voices. I bought them when I had the need for them for a track and they worked great. The quality is good and the phrases are very interesting as the language sounds very passionate. I also liked the quiet speaking samples as I use them in the background of eerie sounding pads where they are almost inteligible even if you spoke the language, to add a little creepiness to the feel. What I don't like is the interface, which is pretty low quality and I don't care for the issues I have had with those few and far between samples that clip. I paid around $100 which isn't too bad for a nice collection of samples, but due the lack of there use over the past year, I probably would not make the same choice. This is the only collection of male middle eastern vocals I have used other than the few ones found in Logic or "all-encompassing" synth/sample sets.